Jimbo's Front Porch: A Guinness Book Hook (SOLD to the lady with the rope to crochet)!! A Guinness Book Hook (SOLD to the lady with the rope to crochet)!! Yea!!! Blogger let me do an image!! 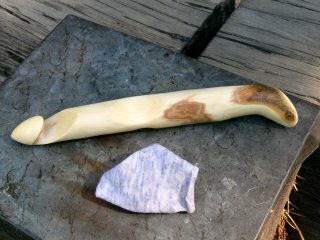 This is the hook i made in the tutorial, and its now finished. Its a monster size, made of bush maple. The handle is formed for pure push and pull function.... in other words it ain't real purty. But the hook end is, and i'll bet it'll make a mean rug hook or whatever you want to make with about an inch diameter hook (off the chart size wise). Now i need to update the tutorial, and we'll see if the blogger will let me do that, but for now, this honkin hook is up for bids! I've got lots more hooks coming up for auction..as fast as blogger will let me post so if you don't have an inkling for a monster hook that will double as a cattle prod or night stick.. stay tuned for some smaller ones. Oh, and lets close this one by say Saturday morning Pacific Std time. And the bidding starts with a respectable $10.00 from Paul Bunyon's wife, Paulette. She mentioned something about crocheting Paul a poncho the size of a Ringling Brothers tent.